Places to see in Somrabazar: Somra bazar has been home to some of the elite Zamindar families in the history of Bengal like the Sens and Mitra Mustafis. Although most of the mansions of the erstwhile Zamindars are now in complete ruins but one can still make out the lost grandeur of these mansions from their Cornithian Pillars, hanging balconies and Durga Manchas. The Anandamoye Temple in nearby Sukharia Village is one of the finest specimens of the 25-pinnacled terracotta temples in Bengal. Founded in 1763 AD, Anandamoyee Temple houses the main temple of Anandamoyee Maa, which is surrounded by 12 smaller temples. Although the present structure of the temple was completed in 1813 AD, few terracotta panels are still in good condition. 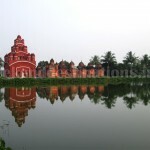 The other notable temples of Somrabazar are Harasundrai Temple built in 1814 AD and Nistarini Temple built in 1847 AD. The Siddheshwari Kalibari Temple on the banks of the Ganges may not be structurally grand as the other temples of Somra bazar but its spiritual and historical importance is immense. 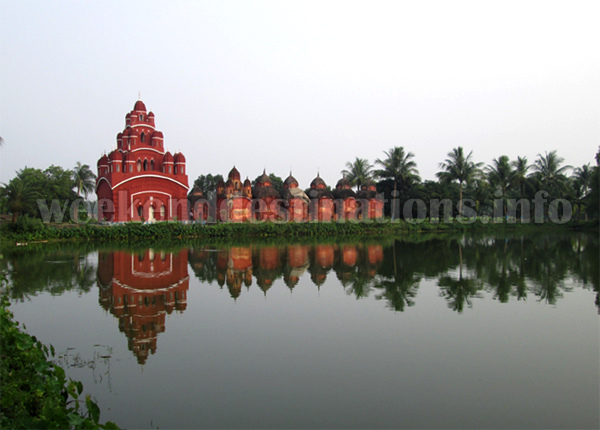 It is said that Rani Rashmoni while sailing beside this temple had the spiritual awakening to found the Dakshineshwar Temple. Nearby attractions in Somrabazar: A 15-mins ride in a Toto or Rickshaw from the Railway Station will bring you to the Ferry Ghat of Somrabazar from where you can take a boat to Sabujdweep. One of the largest river islands in West Bengal over Ganges, Sabujdweep is a protected sanctuary. There are no accommodation options at Sabujdweep but a walk along the banks of this island and spending a few morning hours within this greenery will surely rejuvenate you. 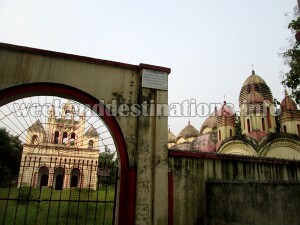 Few other popular tourist attractions near Somra bazar include the Hansheshwari Temple in Bansberia (27 kms. 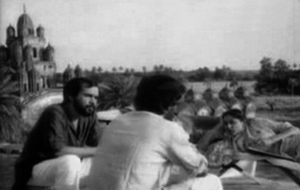 ), Imambara (32 kms) in Hooghly and Bandel Church (30 kms). Things to do in Somrabazar: You can hire a Toto or Rickshaw and visit the temples of Sukharia and Somra bazar. You can also hire a fishing boat in the creeks and sail through the paddy fields and marshlands spotting some rare birds in their natural habitats. You can also visit some of the last boat making factories of Balagarh (7 kms) to witness the dying art of wooden boat making. Also, foodies won’t be disappointed at Somra bazar – the sweetshops of Somrabazar is sure to satisfy the most discerning sweet tooth in India. How to reach Somrabazar: If you prefer travelling in train, then you can take local trains from Howrah or Sealdah to Somra bazar. If you are taking your own car, then take the Barrackpore – Kalyani Expressway (SH6). It takes around 2 hours to reach Somra bazar from Kolkata on this highway. Best time to visit Somrabazar: You can visit Somrabazar anytime of the year. However, the winters are preferred because it brings birds to marshlands. Lodging and dining facilities in Somrabazar: At Somrabazar, you can stay in a newly-built riverside guesthouse with AC and Non AC rooms. You can avail this accommodation for day trips as well as overnight stays. All standard facilities like attached western bathrooms, televisions, electric generators, hot water geysers and comfy beds are available. A small children park area with swings and see-saws have also found its place within the garden of the guesthouse. However, the best thing about this guesthouse is the open rooftop terrace which offers a panoramic view of River Ganges, its distributories and islands. The staff here can make arrangements for local sightseeing and boat rides too. The food is served in the Dining Hall and it is essentially Indian cuisine. The ingredients are usually locally sourced fresh from the nearby fields.